Tinosorb M is an innovative UV filter with a hybrid technology that combines organic filters with inorganic micro-fine pigments. It a water soluble ingredient that is added to sunscreens to provide additional UV absorption. Tinosorb M is presented as a 50% aqueous dispersion of less than 200nm micro-particles which can be easily incorporated in a sunscreen in the water phase of an emulsion. It has numerous advantages: easy to use, can be cold processed, efficient at low concentrations and contains no preservatives. Recent research showed that a microfine organic-inorganic technology ensures enhanced SPF and UVR coverage, because the two components have a synergic effects . Tinosorb M is acts both as an organic UV filter by absorbing the UV radiation and as an inorganic filter (due to the microfine pigment particles) deflecting the ultraviolet radiation . 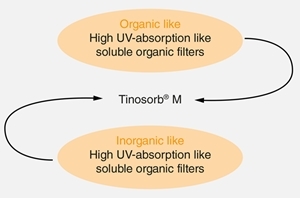 Tinosorb M is very stable  and highly efficient in protecting against both UVA and UVB radiation due to its triple action: UV absorption by a photostable organic molecule, light scattering and light reflection by its microfine structure. This enables Tinosorb M can absorb both UVA and UVB rays, providing a complete protection against the whole ultraviolet spectrum. 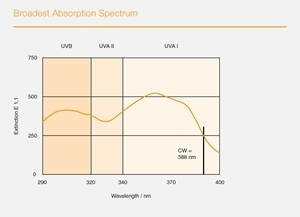 The active ingredient in Tinosorb M, Bisoctrizole is a broad-spectrum sunscreen that absorbs UVR and due to its microfine structure, with particles smaller than 200nm also reflects and scatters. 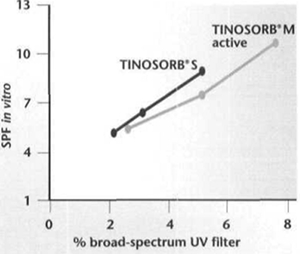 Thus, Tinosorb M is able to succeed where other organic UV filters do not, especially in the UVB area. Research shows that formulations with Tinosorb M have efficiency comparable with zinc oxide (ZnO) and titanium dioxide (TiO2) . Studies assessing bisoctrizole’s safety showed that when formulated into a sunscreen, bisoctrizole has minimal skin penetration, which makes it completely suitable for cutaneous use . Also, unlike other chemical (organic) sunscreens, Tinosorb M is very stable when it comes to UVR photodegradation. Furthermore, bisoctrizole acts as a stabilizing agent for less stable compounds such as avobenzone . Regarding the concern that like other organic UV filters, BASF’s Tinosorb product range may disturb the estrogenic balance, by interacting with the estrogen receptors, laboratory research showed that tinosorb products are safe. No estrogenic activity was registered . Concluding, it can be said that Tinosorb is not only one of the most efficient sunscreen ingredient but also that it is very safe for use. Due to its stability and UVR coverage Tinosorb M is a great sunscreen by itself but it is also a great ingredient for more complex formulations. Due to its stabilizing and synergic effects it can be used in combination with both organic and inorganic UV filters. Formulating Tinosorb M with Tinosorb S aqua – another member of the BASF Tinosorb product range makes one of the most efficient UV formulation available. Combining Tinosorb M with Tinosorb S aqua offers the possibility of formulating oil in water (O/W) suspension. O/W sunscreen suspensions are superior when it comes to coverage, uniform protection and efficiency . O/W sunscreen formulation has several advantages: the UV filters are present in both the water and the oil phase (most sunscreens have the UV filter only in the oil phase), high efficiency at low concentration, superior SPF. And last, but not least, O/W formulations are more cosmetically appealing , with better skin coverage and longer skin resistance (less frequent re-applications are necessary. Figure 3 – oil in water emulsion with active UV filter in both water and oil phases (combination of Tinosorb M with Tinosorb S aqua) . Combining Tinosorb M and Tinosorb S has a synergic effect on both UVA and UBV protection, thus an overall enhancement on SPF. Synergy is the phenomenon that happens when the combination of two or more UV filters has as a result a SPF higher than the sum of the individual SPFs . In conclusion, Tinosorb M is easy to use, safe, stable, stabilizing and one of the most efficient currently available organic UV filters . Note that some studies (by the same authors) indicate that Tinosorb M, containing decyl glucoside, is a frequent cause of allergic contact dermatitis. We suggest that you start out with using a small percentage of this UV filter, test it first on the inside of your elbow for a period of time and, if there are no problems, gradually increase the amount (up to 10%). El-Boury, S., Couteau, C., Boulande, L., Paparis, E. and Coiffard, L. (2007). Effect of the combination of organic and inorganic filters on the Sun Protection Factor (SPF) determined by in vitro method. [online] Doi.org. Available at: http://doi.org/10.1016/j.ijpharm.2007.05.047 [Accessed 28 Apr. 2017]. Carecreations.basf.com. (2017). TINOSORB® M | BASF's Care Creations. [online] Available at: https://www.carecreations.basf.com/product-formulations/product-highlights/product-highlights-detail/TINOSORB%20M/30482916 [Accessed 19 Apr. 2017]. Chatelain, E. and Gabard, B. (2007). Photostabilization of Butyl methoxydibenzoylmethane (Avobenzone) and Ethylhexyl methoxycinnamate by Bis-ethylhexyloxyphenol methoxyphenyl triazine (Tinosorb S), a New UV Broadband Filter. Photochemistry and Photobiology, 74(3), pp.401-406. Herzog, B., Mongiat, S., Deshayes, C., Neuhaus, M., Sommer, K. and Mantler, A. (2002). In vivo and in vitro assessment of UVA protection by sunscreen formulations containing either butyl methoxy dibenzoyl methane, methylene bis-benzotriazolyl tetramethylbutylphenol, or microfine ZnO. International Journal of Cosmetic Science, 24(3), pp.170-185. Mavon, A., Miquel, C., Lejeune, O., Payre, B. and Moretto, P. (2006). In vitro Percutaneous Absorption and in vivo Stratum Corneum Distribution of an Organic and a Mineral Sunscreen. Skin Pharmacology and Physiology, 20(1), pp.10-20. Ashby, J., Tinwell, H., Plautz, J., Twomey, K. and Lefevre, P. (2001). Lack of Binding to Isolated Estrogen or Androgen Receptors, and Inactivity in the Immature Rat Uterotrophic Assay, of the Ultraviolet Sunscreen Filters Tinosorb M-Active and Tinosorb S. Regulatory Toxicology and Pharmacology, 34(3), pp.287-291. Carecreations.basf.com. (2017). TINOSORB® S | BASF's Care Creations. [online] Available at: https://www.carecreations.basf.com/product-formulations/product-highlights/product-highlights-detail/TINOSORB%20S/30481068 [Accessed 19 Apr. 2017]. Google Books. (2017). 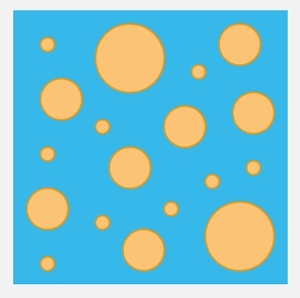 Patent WO2015116899A1 - Oil-in -water emulsion sunscreen composition. [online] Available at: http://www.google.com/patents/WO2015116899A1?cl=en [Accessed 28 Apr. 2017]. Carecreations.basf.com. (2017). TINOSORB® S AQUA | BASF's Care Creations. [online] Available at: https://www.carecreations.basf.com/product-formulations/product-highlights/product-highlights-detail/TINOSORB%20S%20AQUA/30480431 [Accessed 19 Apr. 2017]. Couteau C, Pommier M, Paparis E, Coiffard LJ (June 2007). "Study of the efficacy of 18 sun filters authorized in European Union tested in vitro". Pharmazie. 62 (6): 449–52 [Accessed 19 Apr. 2017].